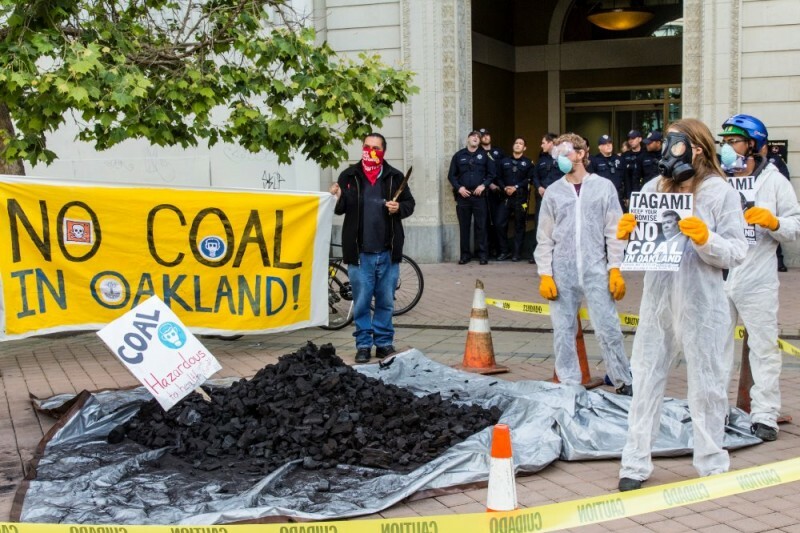 The City of Oakland is now involved a second lawsuit to keep coal out of Oakland. NCIO is supporting these legal actions while working to prevent the funding of the terminal. As we have throughout the court case, NCIO is working with the city to defend the ban. --A possible response to the court decision could be a “redo” of the process of documenting that there is substantial evidence that coal endangers residents and workers in the city (and particularly in West Oakland, already disproportionately burdened with environmental pollution). The judge’s criticisms are being evaluated and we are exploring the possibility of producing new evidence. --A possible resource is data from the city of Richmond, where a dramatic increase in coal shipments is leaving visible coal dust on homes and vehicles, and invisible dust in residents’ bodies. NCIO is supporting Richmond community members as they organize to protect themselves. --Activists in Vallejo are concerned about the possibility that the proposed Vallejo Marine Terminal would ship coal overseas. They are hosting monthly meetings of an alliance of community activists in Oakland, Richmond, Vallejo--and we hope Stockton--to share updates and coordinate strategy. --Whatever happens on the legal front, we can stop coal by preventing the developers from obtaining $200 million that they need for construction of the proposed terminal. NCIO is targeting the investment bankers at the Bank of Montreal who are planning to obtain this money from pension funds. The investment would be marketed as “infrastructure,” obscuring the plain truths that it is a financially risky coal project and, if realized, will contribute to environmental damage none of us can afford. It is outrageous that the pensions of working people would be hustled to fund a coal terminal, and ultimately looted if the risky coal investment proves unprofitable. --Another target is the insurance companies that enable fossil fuel infrastructure by providing them with insurance coverage. We are collaborating with Insure our Future, the U.S. arm of an international campaign targeting these companies. Goals are both to increase the cost of coal infrastructure and deter investment on the one hand and to create conversation about risks and worst-case scenarios on the other hand. --Our campaigns against the bank's funding efforts and the insurance companies' coverage can inspire activists in other communities concerned about fossil fuels. Your donations help us go forward to keep coal out of Oakland and to encourage similar campaigns where they are needed. Thank you for your support! For more updates on our projects, see NoCoalinOakland.info. Apologies for the "update," complete with typo, that you recently received. I had no idea it would go out to all our past donors! I am reactivating the GoFundMe site (with some technical challenges) because YouCaring is merging with them. Meanwhile, the news can be found at NoCoalinOakland.info and our next meeting is Thursday, June 20, 6 pm at WOEIP, 349 Mandela Parkway, Oakland. Have you contacted http://designaction.org/ for help with posters? I/WE fully support NO COAL IN OAKLAND, clean air and a healthy environment for humane-ity and all our relations. Ase`. I don't want coal trains rumbling through our neighborhoods, and don't want coal burned anywhere on the planet!